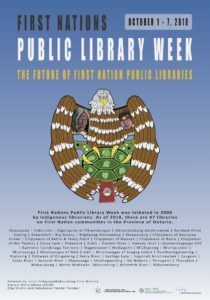 October 1 – 7 is First Nations Public Library Week in Ontario. The week celebrates the vital role of libraries in Ontario’s Indigenous communities by looking to the future and envisioning the possibilities. I love this approach. Innovation in practice inspires communities and increases understanding of the potential of libraries. Certainly we see this in the school library world. Having said that, First Nations public libraries face particular challenges in Ontario. Of the 133 First Nations in Ontario only 46 have public libraries. Tax revenue streams that fund other public libraries in the province are not available to First Nations communities (Ontario Library Association: First Nations Public Library Issues). Raising awareness of these issues should be of vital importance to everyone involved in libraries from every sector. We are all part of the broader library ecosystem. Please help raise this awareness, and support First Nations as they realize the potential of libraries to enrich their communities. This entry was posted in Advocacy & Leadership and tagged CFLA-FCAB, First Nations Public Library Week, Indigenous, OLA, Public Libraries. Bookmark the permalink.